Today I watched as Rodney bitched at Jeff and shouted orders across the shop while “working”. The oil bag sat lonely under the bike awaiting tubing and mounting devices as Rodney rambled on about things pertaining to the ever increasing price of orange juice and flour. Jeff idled slowly by as Rod’s continued dissertations flowed through the shop in and out of the ears of compatriots as they passed by. I could tell his patience was running short and the relationship stressed by flying sparks and shards of metal was at a crucial moment. Things proved more fruitful towards the later part of the day. The oil bag mounted and the gas tank nearly finished provided evidence the relationship was still operational. With the frame and swingarm done it is time to tackle the tank. With a little wrestling and a few select words, a tunnel, tank halves and knee pockets have appeared. 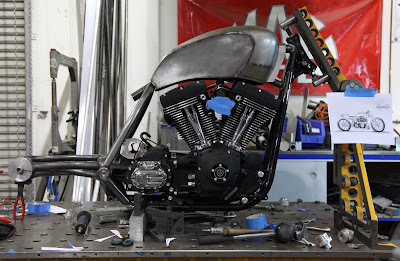 Now that we have the structure of our tank we will look to the rear of the bike and apply some love to the tail section. I can only hope the tail section accepts the affection I’m prepared to give it. Many tail sections and I have failed to make a connection which leaves them laying in the scrap bin and me alone wondering where I went wrong in the relationship. In these lonely times we learn about ourselves and gather up the strength to move on. Often through heartache beauty is born, I just hope we go all the way on the first date. Well we are back at the fixturing table and the swingarm is speaking sweet nothing to Jeff and myself. Each tube is falling into place like soldiers on parade. The shock mount is positioned on the demmeler table and there is no escape in sight. It will concede just as the rest of the tubes have done. Tonight Jeff and I will be drinking cold Budweisers knowing we won the battle of 4130 street. With the help of a whip, I’ve managed to get Jeff to roll the backbone and the two rear legs on Mickey’s new frame. Pain seems to be inspiration for him. 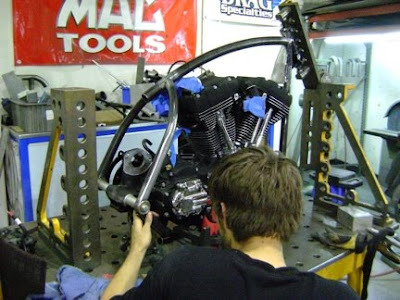 When we start the swingarm I might need a small bat to extract the desired results from Jeff. 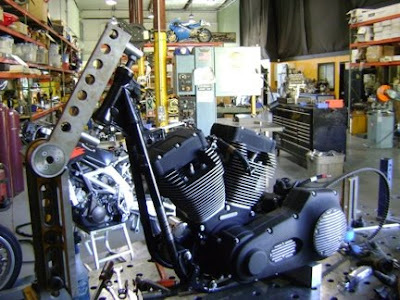 Well not exactly day one, the first day was spent taking apart a complete 05 softail. We used the neck and frame cradle to start our build. The remainder of the bike will be put to sleep in our stock Harley graveyard next door. May all those unwanted parts RIP. Tomorrow we will begin the rebuild of the chassis, make her better, stronger and faster. Stay tuned for updates.